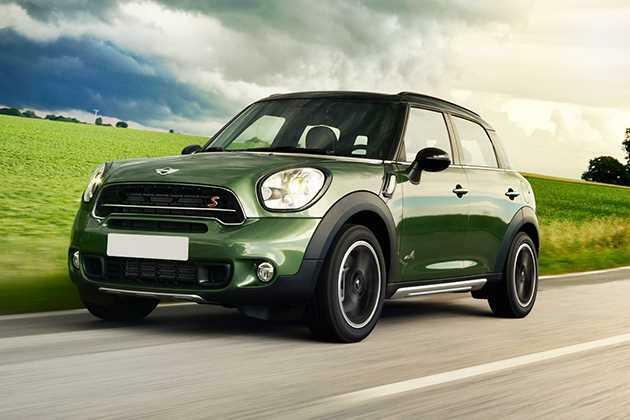 Mini Cooper Countryman D High is the top end variant in its model lineup. This variant is fitted with a 2.0-litre diesel engine, which comes with a displacement capacity of 1998cc. It can pump out a maximum power of 112bhp along with a peak torque output of 270Nm. The most attractive aspect is its external appearance, which has a blend of classy design with ultra modern cosmetics. Its front facade has oval shaped headlight cluster featuring projector headlamps that dazzles the frontage. However, its distinctly crafted chrome radiator grille has three vertically positioned strips, which gives it a dominating look. This SUV is not just stylish from its outside but also captivating from its inside, thanks to the extensive use of leather upholstery. Its dashboard has a unique design featuring round shaped cluster on its center featuring a high resolution color display. It also has a round shaped instrument cluster with white background and trendy dials, which gives a contemporary look to the insides. The automaker is offering this variant with an option to customize the interiors and exteriors with different styling aspects. This enables the buyer to personalize their vehicle as per their choice. Furthermore, it is also available with several attractive accessories as optional, which gives it a unique stance. This package includes a set of lightweight alloy wheels, a set of stylish ORVM caps with elegant color scheme and utility features inside the cabin. This sports utility vehicle is competing against the likes of BMW X1, Volvo V40 and Mercedes Benz A-Class in the Indian automobile market. At present, the company is offering this vehicle with an unmatched two year warranty without limitation to its mileage. In addition to this, it also has 12-year anti corrosion warranty that covers the vehicle against rusting of its body panels. Furthermore, it is also available with a three year warranty period for its paintwork. This variant has an astoundingly attractive external appearance that can certainly grab the attention of car enthusiasts. To begin with, its front facade is arguably the most attractive aspects, thanks to its distinctly crafted cosmetics. It has a radiant headlight cluster with thick chrome surround. In the center, it is designed with a hexagonal shaped radiator grille, which features horizontally positioned slats. The bumper has a dual tone look as it is fitted with a black colored cladding for preventing the vehicle from damages. It houses a large air dam along with a pair of round shaped fog lamps. The side profile looks quite decent thanks to its trendy cosmetics like chrome door handles and high gloss black B and C pillars. It also has styling aspects like aluminum ski racks. Its wheel arches are expressively molded and garnished in black color. They are fitted with a set of stylishly design lightweight alloy wheels, which are covered with high performance tubeless radial tyres. Its rear profile is quite attractive and is designed with a tailgate that is fitted with a flat windscreen along with a wiper. Furthermore, it is decorated with chrome plated company's insignia along with 'Countryman' lettering and variant badge. The windscreen is accompanied by a spoiler along with a third brake light. The taillight cluster has a thick chrome surround, which emphasizes its exclusivity. The internal cabin has a exquisite design that is done up with a black color scheme. The instrument cluster is in a round shape and is positioned right on top of the center fascia. It has white background and trendy dials, which gives it a compelling look. There are a lot of chrome inserts given inside the cabin, especially on door panels, steering wheel, dashboard and on AC vent surround. The cabin is incorporated with ergonomically designed seats featuring side bolsters and adjustable head restraints. The front seats are electrically adjustable wherein the driver's seat also has memory function. Both the front and rear seats are covered with premium leather upholstery, which adds to the plushness of cabin. Its three spoke steering wheel is wrapped with leather upholstery and is mounted with multi-functional switches. There are several utility features given inside like dual front sun visors, an inside rear view mirror, storage box, drink holders and front center armrest. It also has a spacious boot compartment of 350 litres, which can be increased up to 1170 litres by folding its rear seat. This variant is powered by a 2.0-litre diesel engine that has the total displacement capacity of 1998cc. It carries four cylinders and sixteen valves using double overhead camshaft based valve configuration. This mill can generate a peak power of 112bhp at 4000rpm in combination with a torque output of 270 Nm in the range of 1750 to 2250rpm, which is rather impressive. It is paired with a six speed automatic transmission gear box that enables easy shifting of gears. It enables the vehicle to accelerate from 0 to 100 Kmph speed mark in 11.3 seconds. At the same time, they can go up to a top speed of 180 Kmph. This diesel mill can give away mileage in the range of 21.27 to 23.8 Kmpl, which is rather impressive for Indian road and traffic conditions. All its wheels are fitted with robust set of disc brakes, which helps in efficient braking. It is further assisted by anti lock braking system along with electronic brake force distribution and brake assist. The cabin is incorporated with a rack and pinion based electric power assisted steering system that offers outstanding response. On the other hand, the front axle is assembled with a single joint spring strut, while the rear one is affixed with a multiple control arm. The aluminum construction keeps the weight to a minimum and improves the agility of this vehicle, which is a big plus point. The cabin is bestowed with a proficient air conditioning system with rear air vents. This helps in regulating the cabin temperature and in creating a pleasant ambiance. The car maker has blessed this variant with an advanced infotainment system that enables its occupants to listen to their favorite music and keeps them entertained all through their journey. It features a CD/MP3 player, AM/FM radio tuner along with a total of six speakers that delivers an excellent sound experience. It supports USB as well as auxiliary input options. It also has adjustable speed sensitive volume control and Bluetooth wireless data link for hands free function. The presence of reverse parking sensors makes it quite easy for the driver to park the vehicle. It is blessed with a robust body structure that is reinforced at strategic points. It is offered with six airbags as standard. In case of a collision, the dual front airbags safeguards the head and upper body, while the side and head airbags minimizes the possibility of injuries to the head, chest and abdominal areas at the time of side impact. Another key aspect is the dynamic braking light, which starts to flash and alerts the following drivers whenever there is emergency braking. The risk of an impact is also reduced with the help of hazard warning lights that activate automatically. Besides these, it features automatic headlight beam-throw control that provides optimum illumination, whether in rural or urban areas. The engine immobilizer is another feature which protects it from theft, while avoiding any unauthorized access into it. In addition to these, it includes a collapsible steering column, engine check warning, seat belts, ISOFIX child mounted seat, central locking system, emergency interior seat back release, anti theft alarm and so on. 1. Reliable braking and suspension mechanism. 2. Striking exteriors with many stylish features. 1. Maintenance cost is expensive. 2. A few more comfort and safety features can be added.